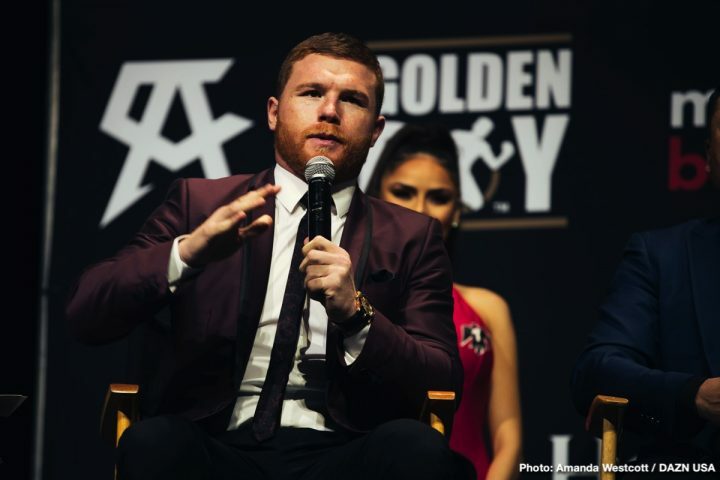 By Sean Jones: Oscar De La Hoya says there WILL be a third fight between Saul Canelo Alvarez and Gennady Golovkin, but it’ll be under his and Canelo’s conditions. De La Hoya doesn’t say what those conditions are, but it’s pretty easy to predict. De La Hoya says Canelo is in the “driver’s seat”, and that he has many options besides Golovkin, and can potentially fight Andre Ward and Sergey Kovalev. The way De La Hoya is talking, it sounds like it’s going to be hard to negotiate the Golovkin trilogy fight. De La Hoya says it’s quite possible Canelo will move up to 175 to look to get big fights in that weight class against Kovalev. De a Hoya didn’t mention light heavyweight champions Dmitry Bivol , Oleksander Gvozdyk or Artur Beterbiev’s names, however. De La Hoya only mentioning Ward and Kovalev for Canelo to possibly fight at 175 suggests that he views those fights as winnable ones for Canelo. The purse split will need to be in Canelo’s favor for the fight to take place obviously. De La Hoya and Canelo will also likely want Golovkin (38-1-1, 34 Os) to agree to the third fight taking place at the same venue as the first two matches between them at the T-Mobile Arena in Las Vegas, Nevada. “Absolutely. And there will be a third fight under my conditions, under Canelo’s conditions,” De La Hoya said when asked by Fighthub if a third fight between Canelo and Golovkin will be taking place. “There will be a third fight, absolutely. Canelo’s in the drivers seat, he can fight anybody from 175 all the way down to 160, including Andre Ward, if he wants to call him out, including [Sergey] Kovalev, including unifying the [middleweight titles,” De La Hoya said. The two fighters have unfinished business after the first two fights being controversial decisions. The third Canelo vs. Golovkin fight is expected to decide who the better fighter is between the two, as long as the judges score it in a way that the boxing public agrees with. With Canelo and Golovkin both signing huge contracts with DAZN, it’s important that they face each other at least once more if not two or three more times. DAZN’s higher ups wouldn’t be disappointed if Canelo and Golovkin fight two or three more times. In a fight that could have gone either way, Canelo (51-1-2, 35 KOs) beat Golovkin last September by a 12 round majority decision on HBO pay-per-view in Las Vegas. The fight came down to the 12th round, which Alvarez won on the judges’ scorecards. Of all the rounds that fans felt that Golovkin deserved, the 12th was one of his best in the fight. Canelo looked good at the start of the round, but then got tired and was punished for the last two minutes. Canelo will be fighting IBF middleweight champion Danny Jacobs (35-2, 29 KOs) next on May 4 on DAZN at the T-Mobile Arena in Las Vegas. De La Hoya revealed that they don’t have a rematch clause in the contract. What that means if if Canelo loses, he could move on. Likewise, if Jacobs loses he won’t be able to fight Canelo again to try and recapture his IBF title. “No rematch clause,” De La Hoya said.